Every important anniversary needs celebration. Even if its diabetes anniversary I want that day to be special and full of fun. Two years ago I realised that ‘today is the first day of the rest of my life’J. Celebration needed to come along with some great cake and chocolate and orange sounded just perfect (two forbidden ingredients just in the title!) The cake is adapted from Nigella Lawson recipe and is as gorgeous as Nigella is! 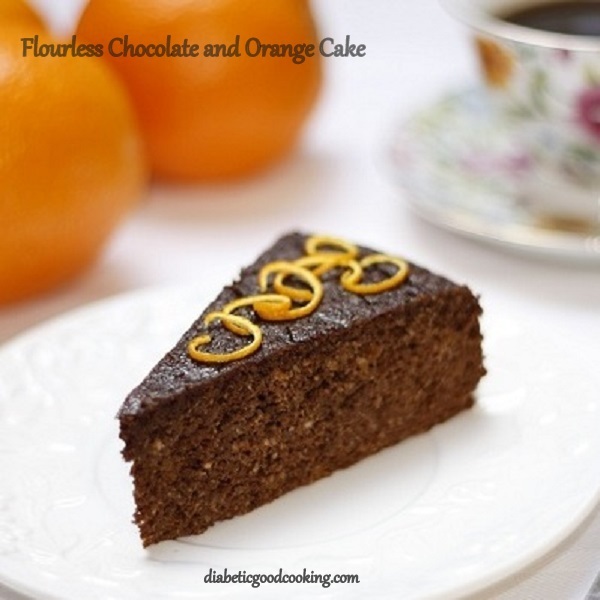 It’s a perfect combination of chocolate and orange flavours and still it's not very high in carbohydrates. 1. Place oranges in pan, cover with water and simmer on a low heat for about 2 hours until soft (do it in advance as cooling takes a while). 2. Preheat oven to 180C and line springform tin (about 20 cm diameter). 3. Place cooled whole oranges in food processor and slightly blend. 4. Add the rest of ingredients (ground almond, eggs, cocoa, sweetener, baking powder, bicarbonate soda) and blend for couple of minutes until you have a smooth batter, but still flecked with orange. Instead of food processor you can use hand blender. It worked fine both ways. 5. Pour the batter into the tin and bake for 45 minutes. Check with a skewer if the cake is baked (the skewer should come out clean). If the cake is still not completely baked cover with kitchen foil to prevent burning and bake for another 10-15 minutes. That looks good. Was Nigella's version flourless?